No one should ever have to wake one day to find their family life and future subject of a negotiation between two factions in which they’ve had no say. This has happened to millions of people because of the UK’s decision to leave the EU! Our aim is to keep the UK within the EU! The final destination of leave was never advertised because there were so many ideas of what that final destination would be. Many never even had a vision of a final destination but were protesting against an establishment that had sold them short and disenfranchised them. Now there is an entirely different group of disenfranchised citizens. Their lives have been placed in disarray by this vote but, despite being the most directly affected, were given no say by not having been given a vote in the referendum at all! Around 3.7 million of these people are EU citizens living within the UK but there are also approximately 1.2 million British citizens living in the EU, who were also denied a vote. It is these British citizens living in the EU, the majority of whom are not a liberal elite, whose stories we are trying to tell. Many are people who served their country for their entire working lives, often in an heroic way, others are still working for their country and many still pay taxes in the UK. How can it be that these people have been denied a vote in a matter that directly affects their everyday lives? 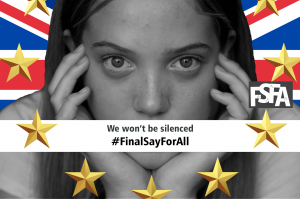 Our intention is to gain a ‘final say for all’ in a second referendum and ultimately to overturn the disastrous decision of Brexit in a democratic manner.